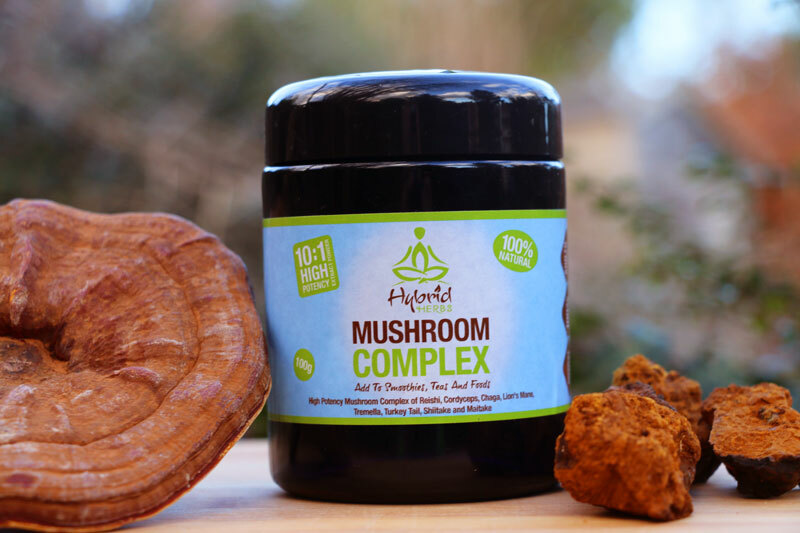 Our Mushroom complex contains a combination of 8 High Potency Medicinal Mushroom powdered extracts in a single serving, including Reishi, Chaga and Cordyceps Mushroom. Packaged in 100% Recyclable Violet Glass to preserve the quality - good for you and the planet. Ready to add to smoothies, teas and foods without any further preparation. At least 100 servings per container! Our Moonrise Mushroom complex has been prepared for you and is ready to go. Just add a small amount (about half to one teaspoon) to a smoothie, tea or food – although our favourite way is simply adding to hot water. Then just sit back, relax and draw in all the delicious benefits. 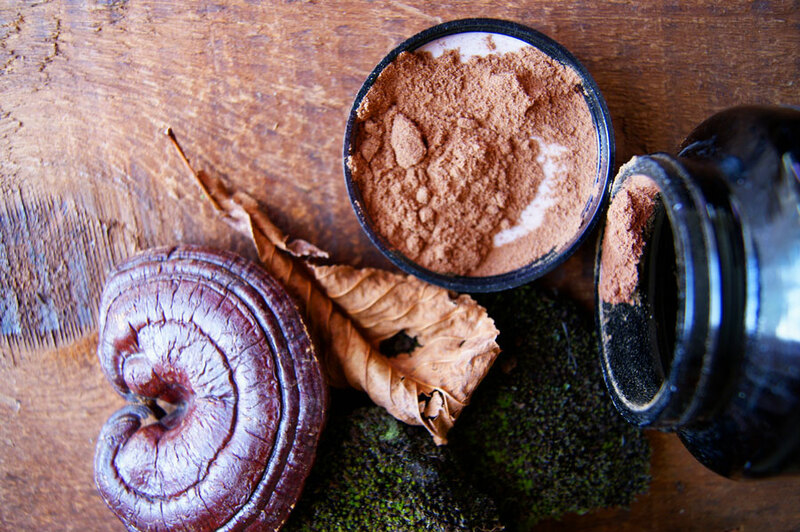 Medicinal Mushrooms have been used for thousands of years to strengthen the immune system, promote vitality and well-being. Grown on wood, straw and other materials all over the world, they’re believed to be safe foods, with little to no reported side effects. Much research has taken place to confirm the potential of medicinal mushrooms in helping to promote the healthy functioning of the immune system. Moonrise Mushroom is perfect for those who want to be introduced to the benefits of medicinal mushrooms, or to go alongside one of our individual packs. Our Moonrise Mushroom complex will reach you in an incredibly strong organic violet glass container, which is reusable and completely recyclable. So you can be good to yourself and the planet at the same time. Ingredients: Proprietary 10:1 extraction blend of Duanwood Red Reishi, Cordyceps Mushroom, Chaga Mushroom, Maitake Mushroom, Shiitake Mushroom, Tremella Mushroom, Turkey Tail Mushroom and Lions Mane Mushroom inside a Miron Glass container for maximum protection. Directions: Simply add 1/2 - 1 teaspoon to your favourite tea, smoothie or beverage of choice and consume. Our Medicinal Mushrooms have already been prepared for you, so they are ready to consume instantly. Simply add 1/2 -1 teaspoon to your favourite tea, smoothie or beverage of choice and consume. "I am delighted by this product and its amazing flavour. I usually like to take it warm in the morning and as an evening cup. The blend is delicious as it is, but I have experimented by adding some Pine Pollen, which adds a delicate pine flavour to the mix. I find the storage of 'Moonrise Mushroom' in a Miron Glass to be an excellent and practical choice. As I undestand, Miron Glass is the best type of container to keep the dynamic energy of a product fresher for longer, away from harmful light. I find this to be a perfect container. I have been drinking 'Moonrise Mushroom' for a couple of weeks now, and apart from enjoying its flavour (which should delight the black coffee drinker), I feel it has a great effect on my mood, enthusiasm, vital energy and clarity. Needless to say, I have been delighted to purchase this product from you and would recommend it to anyone who likes to include the virtue of Medicinal Mushrooms in their diet"
I have this in the morning instead of coffee. Great start to the day. And so far no colds or flu! I bought this after trying it in a restaurant in London, the Medicinal Mushrooms are very tasty. Fabulous customer service, will be buying again when I run out. An excellent product, featuring a good range of mushrooms. I love it and would not hesitate to recommend. This was the second product that I put my son on after starting him off on Red Reishi. I mix all your products in the morning and spoon it in his drinks over the course of the day. My son is severely autistic, yet after 6 months of your products, his behaviour is changing, and he is much calmer. Recommend this product to anyone wishing to take control over their health. The service is as good as their products. this is an alchemical product that has dramatic very fast effect on body and mind!! thank you for bringing it out!